Stage name of David Frederick Wingfield Verner. Learned at age 8 from father, an amateur magician. Moved to New York City in 1913. One of the five original members of the New York "Inner Circle" by 1932. Voted one of the ten living Card Stars in 1938. Known world wide as "The Professor". 1948 Sphinx Award. Moved to Hollywood in 1963 when he became resident magician at the Magic Castle. There he became the mentor of John Carney, Bruce Cervon and Larry Jennings, and later of Jeff Altman, Steve Freeman, Ray Grismer, Earl Nelson, David Roth, Michael Skinner and others. 1968 AMA Masters Fellowship. AMA Board of Directors 1976-79, thence Member Emeritus. 1983 CMI Order of Magic Lamp. SAM Hall of Fame. 1988 Fred Kaps Award. In 1989 Mike Rogers predicted that "There will never be another to influence the art of magic as has Dai Vernon." Many would agree that this is a good bet. Among his most famous inventions are Triumph (by 1946), Travellers (by 1950), Twisting the Aces (by 1960), Depth Illusion (by 1961) and Stripout Addition. This little book contains 12 items in all. There are four tricks and one sleight with cards, two tricks with coins (including one by T. Nelson Downs, the late "King of Koins"), a close-up feat with matches (another Downs specialty, with which he greatly impressed the famous Buffalo Bill), a clever cigarette "switch," an improved method for passing a drinking glass through a table-top, one trick with silk handkerchiefs, and another with tissue paper. 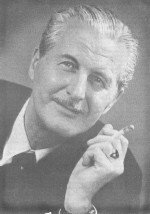 A silent film record of Dai Vernon's visit to Britain in 1958. If you have only read about the Professor Dai Vernon but never seen him in real life, then here is your chance for a glimpse into what he was like. You will see him sightseeing and you will see him perform several of his feature routines such as the Symphony of the Rings , card production, color change, wand spin vanish and more. Text has been reset. Illustrations are from the original 1955 mimeographed edition. 1st edition 1955, 1st digital edition 2014, 14 pages. This work was planned to be the last volume in Dai Vernon's Inner Card Secrets series. However, due to water damage caused by a fire the typed manuscript was lost. It took several years to recover from this mishap and therefore this last volume was originally published much later than the first three volumes ( Inner Secrets of Card Magic , More Inner Secrets of Card Magic , Further Inner Secrets of Card Magic ). The wait was justified because it was and still is one of the important works of card magic - now available as an ebook. No serious card man can exist without reading and studying this work. The highlights in this third part of the Vernon's Inner Secrets of Card Magic trilogy are his teachings on the second deal including a one handed and a stud second deal, the chapter on the "Three Card Monte", and the chapter on palming. 1st edition 1961; original 72 pages; PDF 62 pages. CHAPTER FIVE: LARRY GREY'S "CARDS ACROSS"
The second part in Vernon's Inner Secrets of Card Magic trilogy is the jewel in this series. It features such classics as "Twisting the Aces" (which includes the first publication of Alex Emsley's "Four as Four Count" - better known as Ghost count or Elmsley count), "Out of Sight--Out of Mind," "Oil and Water," "McDonald's $100 Routine," and "The Trick that Cannot be Explained" the ultimate jazz magic effect. You will also find a number of Vernon Touches on his riffle shuffle technique, crimps, Zarrow shuffle and others. This is the first part of Vernon's famous Inner Secrets of Card Magic series. It includes notable work on color changes. In "Dai Vernon's Colour Changing Pack" Vernon provides the proper motivation for the use of the Hindu Shuffle: showing the back color of the deck. "Emotional Reaction" is an example of a subtle and cunning use of a key card. Probably the best effect in this volume is the "Notis Stop Trick". 1st edition 1959; original 76 pages; PDF 59 pages. Lewis Ganson expertly and with care to minute details explains the famous six ring routine devised by Dai Vernon. Vernon first performed the entire routine in front of Ganson's cine camera. By studying the film in slow motion, they were able to determine the most suitable photographs to take with a still camera to illustrate the text. Many considered the best and most beautiful routine for the Chinese Linking Rings. You can see Vernon perform this routine in Dai Vernon in Britain 1958 . 1st edition 1958, PDF 31 pages. This is a fascinating combination of biographical detail and carefully described magical secrets researched and recorded by Dai Vernon and Lewis Ganson. Vernon was an intimate friend of Leipzig. Vernon not only saw many performances given by Leipzig, but Leipzig also explained Vernon in detail how all of his tricks worked and how they are to be performed. Vernon recorded this in his notebooks from which this publication was prepared by Ganson and Vernon. It is therefore fair to say that this is as close as you will ever get to learn from Leipzig. This is a gorgeous and careful digitization of a classic originally published by Harry Stanley in the 1960s. All drawings have not simply been scanned and included as images but have been converted to vectorized graphics. This means they are crisp and clear even under the largest magnification as well as when printed out. This PDF ebook has very detailed bookmarks making it easy to browse to your section of choice. Max Malini was one of the most extraordinary personalities in the history of the performance of magic.